So I am not a huge fan of cheesecake, Why? 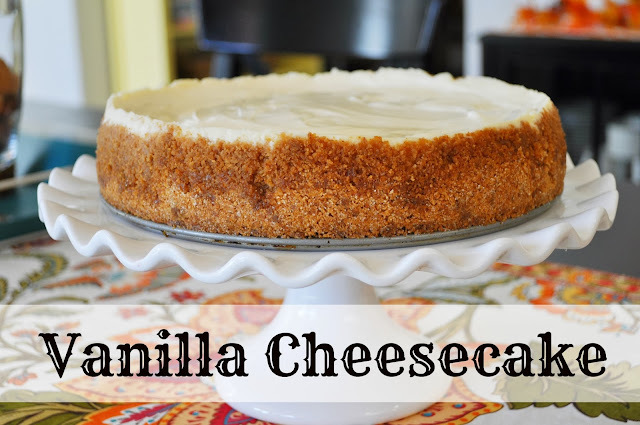 Because they are usually to thick and heavy for me, however, when I tried this cheesecake at a friend's house, it was amazing! Like melt in your mouth, eyes rolling back amazing! I am serious! I could go on and on. It is not heavy at all and somehow feels light and fluffy! Like no other cheesecake I ever tasted before. I texted my friend and asked her for the recipe. She said it is from a cook book, not sure which one. But all the credit goes to my awesome friend Rita for sharing this recipe with my family! Position the rack in the center of the oven and preheat the oven to 350 degrees F. Lightly spray a 9-inch springform pan with vegetable-oil cooking spray. Mix the graham cracker crumbs, sugar, butter, and kosher salt in a small bowl. Using your fingers, press the mixture evenly into the bottom and one third of the way up the sides of the prepared pan. Bake for 10 minutes. Transfer the pan to a wire rack and let cool, about 15 minutes. Reduce the oven to 325 degrees F.
Combine the eggs, vanilla extract, contents of 1/2 vanilla bean, and kosher salt in a small bowl. Set aside. In a bowl, beat the cream cheese on low speed until creamy, about one minute. With the mixer running, slowly add the sugar, then stop the mixer and scrape down the sides of the bowl. Continue beating until light and creamy, about 30 seconds. With the mixer running, slowly add the egg mixture in three addictions, scraping down the sides after each addition. Do not overbeat; if too much air is incorporated, the cheesecake will crack. Pour the filling into the cooled crust. Put the pan on a baking sheet and bake until the cheesecake is just barely set in the center (it will still jiggle when moved), 45-55 minutes. In a bowl, lightly beat the sour cream, sugar, vanilla extract, contents of 1/2 vanilla bean, and kosher salt, about 1 minute on low speed until incorporated. Remove cheesecake from the oven (keep the oven set at 325 degrees F). 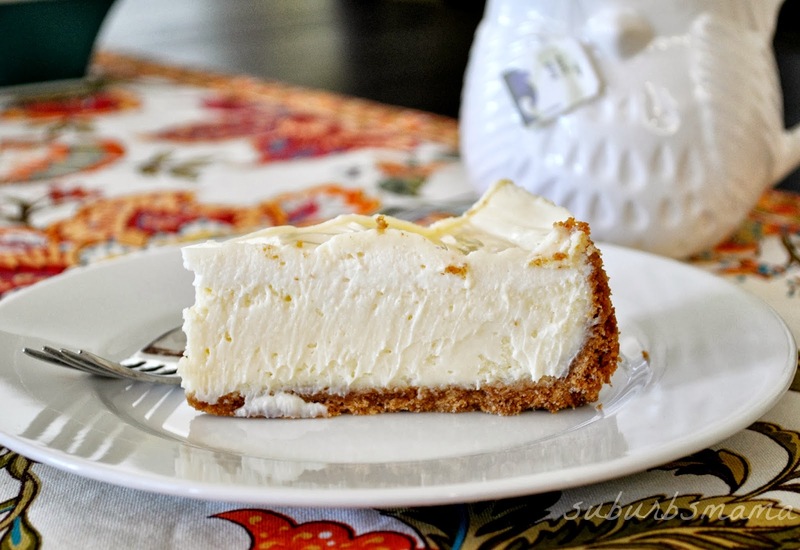 Spread the topping over the cheesecake and bake for 10 minutes. Transfer the pan to a rack and let cool, then refrigerate for at least 6 hours of preferably overnight before serving. Wow this sounds delish! I too find cheesecake a bit heavy so your description really caught my eye! I think I will try this recipe! I am sure you will love it then! My hubby loves it with some cherry pie filling on top, but I think it is perfect as is. Enjoy! Oh wow! I need to try this one! Thanks!